The Chicco MyFit® LE harness/belt-positioning car seat is designed to grow with children from toddler through big kid with easy transition from five-point harness to vehicle seat belt. Nine headrest positions accommodate growth throughout both modes and work together with a four-position recline to support proper posture. An extra-deep ErgoBoost® seat with dual-density foam padding is sloped and contoured for superior comfort. From the makers of the #1-rated KeyFit® and NextFit®, the MyFit® LE is designed with smart functionality that makes it the easiest to install simply, accurately, and securely, every time. A four-position ReclineSure® leveling system and RideRight® bubble levels help achieve and verify proper angle in the vehicle seat. Premium LATCH connectors with a SuperCinch® tightener and a LockSure™ belt-tightening system with wide routing make it easy to achieve a tight and secure fit with LATCH or the vehicle seat belt. The Venture fashion features the subtle nuances of tone-on-tone cool grey hues. Dark grey matte vegan leather wraps the armrests for comfortable, wipeable convenience. 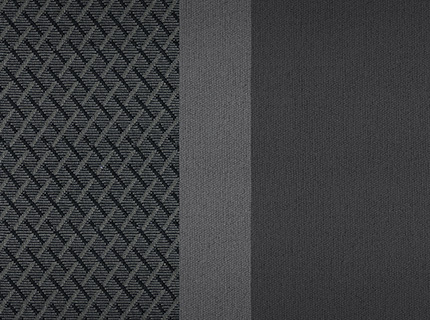 A black and grey crosshatch patterned knit delivers a distinguishing finish to this fashion-forward style. MyFit LE Harness + Booster Car Seat - Venture is rated 5.0 out of 5 by 16. Rated 5 out of 5 by MelTS from LOVE this car seat Best car seat ever! I actually bought a second one for our other vehicle. My son was so excited about it and he too loves it. This was by far the easiest car seat I have ever installed. Usually I'm wrestling the car seat, but this one only takes minutes. My son says it's very comfortable. He loves the cup holders and snack tray. I love that it can turn into a booster. It is very easy to adjust the height. You will not be disappointed!!! Rated 5 out of 5 by MyaElz from Great investment Bought this last night at buy buy baby. We spent some time there debating between this one and a Graco, which was for the same price. We ended up choosing this one due to, according to the sales woman, it endures tougher safety testing. It has breathable material which is great since my son sweats easily. Installation was so easy and quick and most importantly, safe. It won't budge. It hastwo arm rests, with two cup holders with an attachment where you could add to hold snacks or small toys. I have found my new go to brand. Will be recommending to every parent. Rated 5 out of 5 by HCusumano from The Perfect Fit I truly love this car seat for my little one. I was looking for excuses to take her out just so I could put her in her new seat. There is so much protection and comfort for her and she transitioned to forward facing great. I love how simple it was to install and how secure the car seat was - we tried to shake and move it once installed and it didn't budge. My little one loves the toy console and cupfolders for her water and it looks like the seat was made just for her. Rated 5 out of 5 by Michelle S from Amazing seat I bought my seat from buy buy baby as a replacement for the NextFit after we were in an accident. I am so happy with our decision to buy this seat instead of another NextFit. This seat was clearly designed by a parent who has lots of experience putting seats in and out of cars which can be a frustrating experience. Every complaint I had about the NextFit is made better with this seat. (Don't get me wrong, the NextFit is a great seat, but has some difficulty in some areas.) The latch straps are longer for easier installation, the button that was on the tether strap is gone and has been replaced with the much easier to use slide. The cup holders even snap into place so that they are easily removable by a parent but can't be ripped off by a toddler in the middle of a tantrum and thrown across the car. I am now ready to go buy another MyFit to replace the NextFit in our other car. Rated 5 out of 5 by Lexsie27 from Absolutely Amazing! I just got this car seat two weeks ago and I’m obsessed ! It was really hard finding the perfect car seat that my daughter will be comfortable in. And I’m so happy I made this decision to get Myfit LE Harness. Rated 5 out of 5 by Lablyth from Safe, comfortable seat! We’d been using Chicco’s NextFit seat and have been really happy, but wanted a larger seat for our daughter. The MyFit LE exceeded all our expectations! It was easy to install and is very comfortable for her without jeopardizing safety. The headrest has lots of padding and the arm rests and cup holders make her feel like a big kid! We were given this product from Chicco in return for an honest review. We love it because of the high safety rating and our daughter loves it because of the comfort. I’d highly recommend this product! Rated 5 out of 5 by MamaGarland from Favorite harness booster hands down We have always used chicco for all 5 babies and I can honestly say there is no other brand I'd rather use! I did buy 2 different comparable seats, In different brands for our other vehicles because they were cheaper and was swiftly reminded why I love chicco. Gave those away just to buy 2 more of these to replace! Rated 5 out of 5 by annecw17 from Highly Recommend This Car Seat!! We recently got the MyFit LE Harness + Booster Car Seat in the Venture fabric for our 6 year old son. We would say it was easy to install, the directions were very thorough for the various configurations, and he just looked more comfortable in the seat. Buckling him in is very easy, the straps are easy to tighten and makes him feel very secure. The transition of getting our son into the booster was seamless! We originally installed it with the seatbelt, however, he asked us to convert it back to the 5 point harness because it made him feel safer so we did and he is very happy. Now to quote our son, when we asked him what he thought about the seat he said, “it’s super great and I love it; it’s perfect! I love that it’s more padded; it’s spacious, makes me feel safe, my legs feel great and I like the cup and snack holder tray.” Oh and “it feels like a race car seat.” Having the safety of Chicco keeps our mind at ease and having our son happy makes us happy. We would highly recommend this seat for any child transitioning into a booster. How tall is the base of the seat? I am trying to get an idea about the height my child will sit at. How far away from the seat back are the cup holders/storage? My daughter has tiny arms &amp; I want to make sure she will be able to utilize them b4 I buy. The measurements are located on the website under the &quot;specifications&quot; heading. Please call customer service at 1-877-424-4226 for additional assistance. My child is over 40 lbs and in the salt belt mode. Can I use the latch system in the seat belt mode? If so what is the weight limit? The MyFit may be used in harness mode for children at least 2 years old who weigh between 25 and 65 pounds, and height is 54 inches tall or less. The car seat may be installed using Latch in harness mode between 25-40 lbs. In harness mode, if a child weighs between 40-65 lbs, the car seat must be installed using the seat belt. The MyFit may be used in booster mode for children at least 4 years old who weigh between 40 and 100 pounds, and height is 38 to 57 inches. Using Latch in booster mode is completely optional. The car seat must be installed using the vehicle seat belt. Please refer to the product manual for installation instructions. I see that the MyFit it is certified for use on an airplane in harness mode. In the manual, it states to use the back tether for a lap belt only attachment. This is not available on the plane. Also, is there a way to &quot;lock off&quot; the lap belt? Do you have to uninstall and reinstall the MyFit seat to recline it? Or can it be reclined and set up straight while installed? To adjust the recline, loosen the LATCH (or the vehicle belt) and Tether Straps, re-adjust recline and repeat installation steps to make sure Child Restraint is installed properly. Make sure Bubble is between lines on label. What is the difference between the MyFit LE Harness plus booster and the MyFit Harness plus booster? In addition to the features on the MyFit car seat, the MyFit LE has the SuperCinch Latch tightener, kid storage console, ultra-comfort harness management pads, and leatherette arm rests. Can this seat be installed with inflatable seatbelts? The MyFit and MyFit LE cannot beinstalled using an inflatable seat belt in harness mode. For installation in booster mode refer to your vehicle owner&rsquo;s manual for instructions for use with this Booster Seat. Will this carseat be available in the &quot;zip&quot; anytime soon? The MyFit Le is currently not available with a zip off fabric.